My dog Darby looks fantastic in a Halloween costume. For pet owners like me, it’s one of the fun things about the holiday. But as an emergency veterinarian, I have to admit that I also think of all the things that can go wrong for our dogs and cats during what has become Halloween season. That’s because I’m going to see so many pets in the emergency room – Halloween is actually one of our busiest days of the year! The good news is that most of these mishaps are entirely preventable. Here’s some advice for making this Halloween a safe one for your pets. First and foremost, don’t forget to hide the candy someplace where your pet won’t get to it. I know that sounds obvious, but after a long night of trick-or-treating, it’s possible that your exhausted little astronaut or vampire might plop her bag of goodies right down on the bedroom floor. You can guess what happens after that! Dogs will devour a pile of treats. This is bad for many reasons. First, chocolate contains theobromine and caffeine, which are toxic. Dogs who have eaten chocolate may become agitated or extremely thirsty, or may experience vomiting and diarrhea. Respiratory and heart rates could increase to a dangerously high level, and in severe cases, dogs can develop seizures or experience heart failure. Xylitol is another toxic substance for dogs. An artificial sweetener most often found in sugar-free gum, xylitol causes a dog’s blood sugar to drop, which may result in seizures, liver failure, and even death. Anytime you’re afraid your pet has swallowed something toxic, consider calling the ASPCA’s 24-hour poison control hotline: 888-426-4435. For a small fee, you’ll receive a wealth of information that could save your pet’s life. ER veterinarians such as myself call this number frequently and are very thankful for clients who have already established a case with them prior to arrival. Above all, don’t delay. If you’re concerned for your pet’s safety, don’t hesitate to call your primary care veterinarian or take your pet to a local emergency veterinarian. 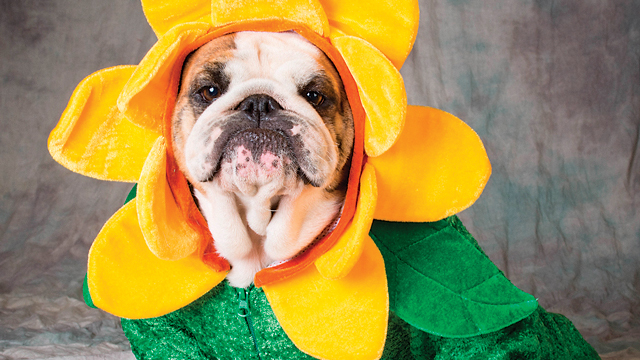 Next, if you’re dressing up your pet this Halloween – like so many of us do! – please choose non-restrictive costumes that fit well and don’t have choking hazards. Decorations are another concern for pet owners during Halloween. Your dog might enthusiastically gobble a pumpkin that has gotten moldy or mistake a decorative corncob for the real thing. What’s wrong with a corncob? It can actually cause an intestinal blockage and require emergency surgery. If you’re one of the many families who like to light up your home with a string of pumpkin lights or something similar, be careful here too. Cats love to chew on and play with anything string-like. It’s not uncommon for me to treat cats who have received burn marks after chewing an electrical cord. Electrocution from these cords can also cause more serious injuries affecting the heart, lungs, blood pressure, and even eyes. What if you’re using battery-powered decorations? Be mindful, because dogs have been known to swallow batteries. This seems less tasty than a corncob, but it is no less dangerous. Batteries also can cause a blockage that requires surgery. And if batteries leak, that can cause burning inside the mouth and GI tract. One of the most obvious dangers about this holiday for your dog or cat is the doorbell! If your pets are easily excitable or nervous, keep them away from trick-or-treaters and the commotion that happens at the door. With so much going on, it’s not uncommon for pets to escape. And then there are a host of other possible dangers, including getting hit by a car. I encourage you to keep proper identification on pets, including tags and up-to-date microchips. Halloween is supposed to be fun and carefree! I hope these tips help your family turn the holiday into a slow month at work for me. Previous articleCan Your Kid Help a Bullied Kid? Next articleHang on to this issue!